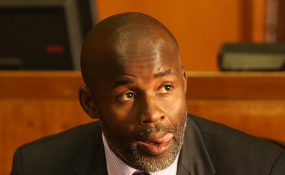 Independent Norton MP Temba Mliswa. Independent Norton MP Temba Mliswa and his Chegutu West counterpart Dexter Nduna, were on Thursday dropped from the newly constituted Mines and Mining Development Portfolio committee, Speaker of Parliament Jacob Mudenda announced. Mudenda retained all the other members of the old portfolio committee which was dissolved after a chaotic period in which allegations of corruption against some MPs were raised in February. Mliswa has been replaced as chairperson by Zanu PF MP for Shurugwi South Edmond Mkaratigwa. Announcing the new appointments, Mudenda said: "I would like to inform the House that all members of the dissolved Mines and Mining Development Committee have been reappointed to the same committee except Hon. T. Mliswa and Hon. D. Nduna." The Speaker also removed Nduna as chairperson of the committee on Transport and Infrastructural Development, replacing him with another Zanu PF MP Oscar Gorerino who represents Shamva North constituency. "I also wish to inform the House that Hon. Oscar Gorerino has been appointed chairperson of the portfolio committee on Transport and Infrastructural Development. "The committee membership remains unchanged except that D. Nduna is no longer a member of that portfolio committee," Mudenda told lawmakers. Although reason for their sacking were not made public, Mliswa could be paying the price for having accused Mudenda of selective application of law and protecting corrupt lawmakers that he said were in the habit of demanding bribes from parastatals. The Independent Norton MP suggested Mudenda was a beneficiary of proceeds of corruption. "Nduna, a thief, who stole US$11 million from Zinara (Zimbabwe National Road Administration) is given a committee to chair, because he used to eat with Speaker," Mliswa said then. The claims led to a near fistfight between Mliswa d Nduna including death. The two later announced they had made up with Mliswa publicly apologizing to Mudenda for his unsolicited rant. Mudenda has since established an internal team meant to investigate "media reports of corruption" against Mliswa.